Photocopiers are an office staple. Whether you rely on a single or multi-function machine, there's no denying an office photocopier can be busy as the staff themselves! Without regular servicing, the demand can lead to copy problem such as paper jams, cartridge and toner issues, streaks or lines on paper, wrinkled pages, discoloured printing, and random spots across your prints. Thankfully, the most common photocopier problems can usually be fixed in minutes. Some can even be avoided altogether with proper maintenance. Servicing does not only lengthen the life of your copier but ensures you don't have to troubleshoot problems at all. Photocopy jams slowing down office productivity? Contact our friendly team at Copysonic on [phone] to keep your workflow moving. A run-of-the-mill paper jam can cause a surprising amount of office disruption as it creates both a standstill and a backlog. Paper jams tend to happen at the worst possible times and are usually the result of a poorly set-up machine. The reasons for paper jams include using the wrong type or thickness of paper, loading the paper incorrectly or allowing dust to build up inside the copier. If a user stacks too many pages in the supply reservoir, it is almost certain to result in a jam. To return your office copier to normal, you will need to manually remove the jammed paper and reload the proper paper size or correct the paper alignment. Be very careful not to pull out the jammed paper too quickly, or you may leave tiny, torn pieces of paper stuck in your photocopier. If your office copier is continually jamming, call a local copier specialist for repairs as they may need to come and clean your feed tires or check for built-up dust inside your machine. Most of the time, cartridge and toner issues occur because the photocopier hasn't been correctly set up. Problems can arise if you don't use the right toner cartridge for your specific printer model as most copy machines require a particular type of toner. If you unknowingly use an incompatible cartridge, your print quality will suffer. Low, empty or malfunctioning toner issues can also wreak havoc with your photocopier. 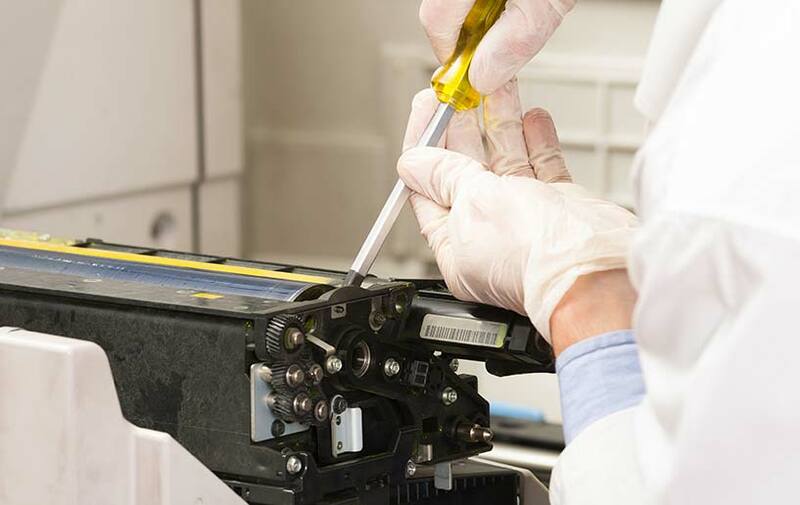 If your toner is low or empty, a simple replacement should solve any problems. If it doesn't, that means there's a malfunctioning issue due to either manufacturer error or compatibility complications. 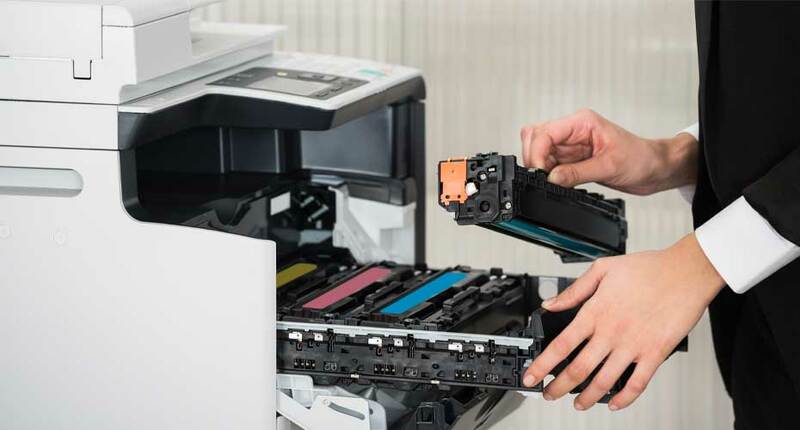 In this instance, talk to a trusted copy specialist about what type of toner or cartridge you need - they will be able to help you determine which kind of toner is most compatible with your machine. If your copier's reproductions keep showing up with streaks, lines or other deformities - even though the paper is snowy white when you look at it in the feeder - it can make your important documents look sloppy and unprofessional. Streaks or lines on paper often occur because there are foreign substances on the scanner glass or issues with the photocopier's fuser. If you use a multi-function machine, they can also be the result of by malfunctioning drum or developer units. For example, a drum blade malfunction can cause large lines appearing vertically down a printed page. Whatever the reason behind it, streaks or lines on paper is unlikely to be a copier issue you can solve yourself. Your best bet is to get your copy machine serviced by a dedicated copier specialist who will be able to identify and repair the problem quickly. Wrinkled or crinkled pages out of the copier machine are usually due to worn out feed and exit rollers that cause sticking or jamming. To fix this problem, you can either purchase replacement trays or enlist a copy specialist to repair the fuser assembly. While it may look like it's merely a case of some paper getting stuck or overloaded in your machine, wrinkled pages are often an indication that your copier has endured too much wear and tear to be functioning correctly. If wrinkled pages aren't the only issue you're experiencing with your photocopier, consider whether it may be time to rent or buy a new machine. Technology changes rapidly, and ongoing repairs and maintenance to an outdated machine can be costly. Upgrading your office equipment can sometimes be a better investment for meeting your evolving printing and copying needs. Smudges, poor image quality or discoloured printing can be incredibly frustrating to deal with in a busy office environment. If your copies are coming out too light or too dark, it could mean that the density controls on your photocopier are imbalanced. Consult your printer's manual to find out how to reset them or call a copier specialist to get expert advice. At Copysonic, our copier technicians have a minimum of 15 years experience repairing and installing office printers. We know the ins and outs of all the leading copier brands and can usually resolve common photocopier problems in less time than it takes you to make a cup of tea and come back. Better yet, when you get your machine serviced by us, we offer ongoing support for parts, labour and toner refills. We've spent the last 25 years identifying what companies need and providing photocopier repairs and servicing. No one wants their professional work documents looking like a dot-to-dot. If your printing is churning out copiers with random spotting across them, it could be due to debris on the copy mirror. You can fix this by simply cleaning the copy glass and mirror. Most copier manuals will provide some recommendations for how to go about the cleaning process and suggest which products to use. Random spotting across your copies is, however, a definite indicator that your office copier needs a little more TLC than it's been getting. As photocopiers are such an essential tool for completing daily office tasks, it's vital to invest in regular servicing and maintenance to lengthen their lifespan. Next time you have an office photocopier issue, refer to this list to quickly ascertain what the problem may be and the best route to fix it. To chat with our friendly team at Copysonic about photocopier repairs or servicing, send us a message online or call [phone].